ISL get their Hands Dirty: Compositional Analysis of Kerbside and RHWS Residual Wastes for Leicestershire County Council. Leicestershire County Council has appointed Integrated Skills to carry out a comprehensive analysis of the residual household waste it manages. The results will update previous analyses and inform strategic plans for future waste transfer, haulage and disposal services. Commenting on the waste analysis project for Leicestershire County Council, Patrick Scott, Managing Director, said “we are very pleased to be assisting Leicestershire with this project. Waste analysis is fundamental to the development of any strategy for managing wastes”. Waste composition analysis (WCA) provides information about the types and amounts of the materials that are in a given waste stream. Data is gathered by physically sorting the waste by hand into a number of predetermined categories. Each category is then weighed and the results are collated to provide a breakdown of the total composition of waste that has been sampled. Integrated Skills’ specialist waste analysis team has extensive experience in the UK and elsewhere including the States of Guernsey. Past projects have taken the team to the Middle East and as far as Samarkand in Uzbekistan! Waste management consultancy has been a core service since the inception of Integrated Skills in 1993. All aspects are covered from strategy development and procurement advice to planning and permitting. 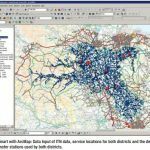 Combining knowledge and experience of waste services, together with a core competency in information technology, has lead Integrated Skills to become expert in route optimisation and the UK distributor for RouteSmart™ for ArcGIS. Integrated Skills also develops and supports a comprehensive suite of software solutions including in-cab navigation, environmental contract management, streetworks coordination and mobile applications. In recent years the company has broadened out from waste and environmental services to include utilities and postal services.